We present R2U2, a novel framework for runtime monitoring of security properties and diagnosing of security threats on-board Unmanned Aerial Systems (UAS). R2U2, implemented in FPGA hardware, is a real-time, Realizable, Responsive, Unobtrusive Unit for security threat detection. R2U2 is designed to continuously monitor inputs from the GPS and the ground control station, sensor readings, actuator outputs, and flight software status. By simultaneously monitoring and performing statistical reasoning, attack patterns and post-attack discrepancies in the UAS behavior can be detected. 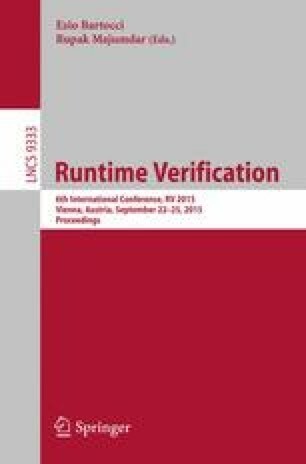 R2U2 uses runtime observer pairs for linear and metric temporal logics for property monitoring and Bayesian networks for diagnosis of security threats. We discuss the design and implementation that now enables R2U2 to handle security threats and present simulation results of several attack scenarios on the NASA DragonEye UAS. This work was supported in part by NASA ARMD 2014 I3AMT Seedling Phase I, NNX12AK33A and the Austrian Josef Ressel Center (VECS).